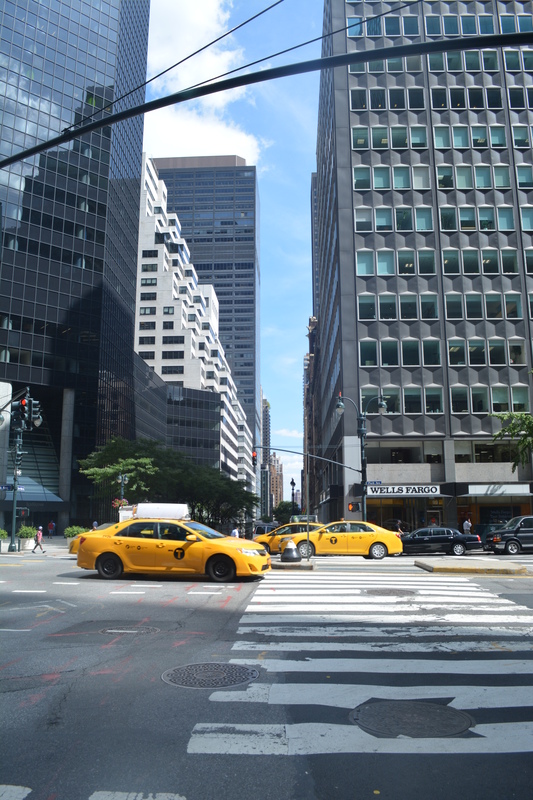 My experience studying at Parsons in New York was an exciting yet daunting experience. I felt at ease knowing we spoke the same language and there wouldn’t be any difficulty there. I soon found out that wasn’t completely the case as numerous words we use in the UK are completely unheard of in the USA. Such as the word ‘knackered’, they hadn’t a clue what I was talking about. The education system in America couldn’t differ more from the European education system. The level of organisation within the university was amazing. I found it difficult at first adjusting to their way of teaching. Each week there was a set homework that had to be in for the following class. Having specific classes with different professors was something that took me time to adjust to. I had to attend seven classes a week, all at 3 hours long. Attendance at university in the UK is a real problem, something I can’t understand when the students are paying so much money to be there. Parson’s way of clocking attendance was brilliant, if you missed three or more classes you were kicked out of that class and didn’t gain any credits. People complained but it worked. The teaching was unflawed, from not knowing how to pattern make or drape or make shoes etc I completed four garments and a pair of shoes and much more in just one semester. I have left Parsons with a whole new set of skills of which I will incorporate into my Chelsea work. I received excellent grades at the end of the semester of which I am very proud of. However there were challenges along the way. First of all being plunged into a subject I had never studied before, Fashion design and getting out of the independent way I have always been used to working in. The professors were very particular about how they wanted things presented and what sort of things we were able to make and learn. I didn’t enjoy not being able to get stuck into a project. Due to the work load and the marking of technical ability there wasn’t time to get into a project and have weeks of research. I had to stop myself or else I would have had far too much work. The work load was insane. I am a hard working student however the workload Parsons put on students I feel was too much for one semester, people slept at uni as they felt they didn’t have enough time complete all that needed to be done. I had seven finals to complete in just over two weeks. The key thing I will bring back to my practice at Chelsea is my new found knowledge in Fashion design. Although I may not want to become a fashion designer, if I am a textile designer in a fashion company it is important to understand all areas of the process within that company. My overall experience was amazing. Living in a different environment for such a long time and learning to adapt to the fast pace living in New York was exciting and life changing. I fell in love with New York and it is now my aim to work there after I graduate. Parsons was even more international than UAL, meaning I met people from all over the world, making contacts for my future career. It was scary to see how many talented young designers there are. Parsons is a much bigger university than Chelsea, with the courses holding 300 students. It was liberating to see each students incredible work ethic. I am so grateful to have had this experience, not only to acquire a whole new set of skills but to bring me closer to reality of how hard I will have to work to achieve my dreams and goals. My opinion of American education system is that I feel they need to let their students have more of their own creative input into their projects. However their teaching and organisation of the university is something I think European Universities need to take on board. The perfect course would be if Parsons and Chelsea met somewhere in the middle. More guidance from Chelsea and more independence given to students from Parsons. With these thoughts in mind, I guess these are the facts that separate the two universities, it would have been a shame if Parsons ran in exactly the same way as Chelsea as I wouldn’t have learnt as many new things as I have. I encourage anyone who is currently studying at a university that offers a study abroad programme to apply for it. Not only do you learn more academically and technically, you grow as a person and have life experiences that are invaluable. 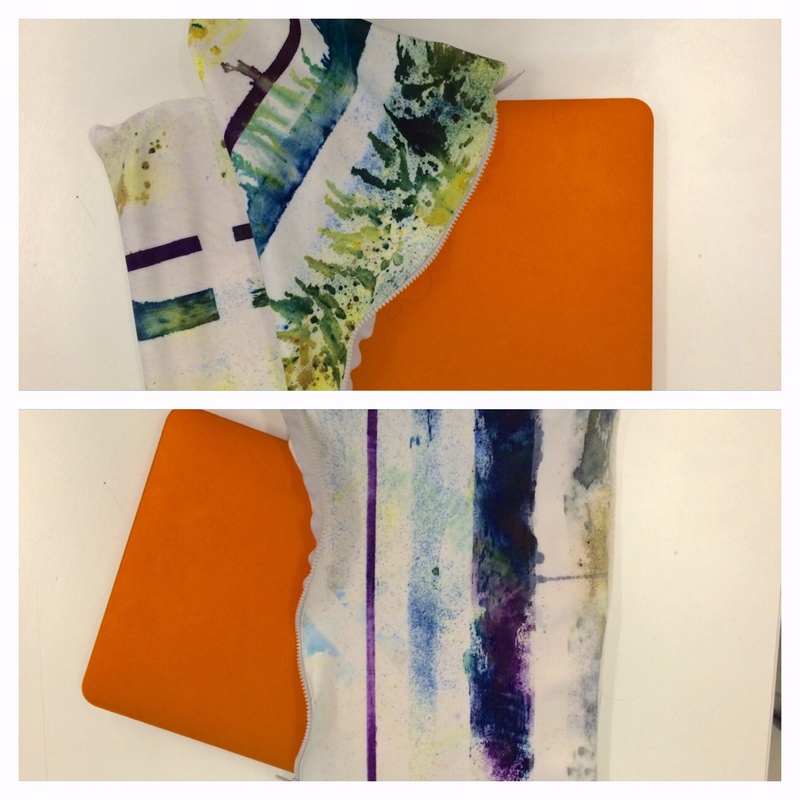 Some images below show my Textiles class final outcome. I made a laptop case using neoprene and printing using disperse dyes applied directly to the material. I controlled the lines using masking tape and saturated the material in water causing the dye to mix and create a speckled effect. I still can’t believe how lucky I am to have lived in New York for five months. Not only that but I got to spend the build up to Christmas living in the centre of Manhattan. Manhattan at Christmas time is truly magical. From Saks windows with a christmas show projected onto the building every 15 minutes along with the amazing modern fairytale window displays, to the famous Rockefeller centre with it’s iconic ice skating rink.Then there was Central Park, which held another beautiful iceskating rink of where I had the pleasurable experience of attempting to skate. The atmosphere was invaluable. New York city really is the capital of the world. The pressure was on in Shoe Construction from the very beginning. Not only was it something I had never even remotely done before, I had to attend two classes nearly every week in order to have them completed 3 weeks before the hand in, to allow time for them to be soled. Proudly I was one of the only students who managed to achieve this goal. I always looked forward to Hand knitting class. It was relaxing and clam, and it was taught by my favourite teacher at Parsons. For my final garment I wanted it to be wearable and I wanted it to be complete. We were given the final only two weeks before hand in, in which time we had 6 other finals to complete as well as somehow knit a garment! I chose to make a sleeveless turtle neck using just simple knit and intarsia on the front and turtle neck. I used jersey yarn that is made from old t-shirts cut up and made into yarn. The low armholes and high turtle neck give it a fashion feel and would look great with nothing underneath or layered over a black long sleeved top. Draping Final, Done and dusted! The last week of the semester is officially here. I can’t quite believe 15 weeks have passed so quickly and four months of being in New York has just gone in a flash. Terrifying. I haven’t worked this hard in all my life, and anyone who knows me knows I’m a hard worker. These past two weeks have been crazy. Draping was a challenge. I have never made and constructed a garment to a professional standard before, never mind draping it from scratch. I set myself a challenge of draping lapels and a collar but it all paid off! The atmosphere of final hand in makes the weeks of madness completely worth it. My final outcome is attached to this blog post. It was inspired by Christian Dior A/W 14 collection. I have fully faced the neck, lapels and armholes. I have french seamed the inside for a clean finish and turned up the hem twice to insure they would be no fraying. Thanksgiving, I have always known about it due to tv shows such as Friends but never really thought there was much point in it. UNTIL I had the opportunity to experience it for myself. Thanksgiving for starters means days off work, school, college and university, that alone I believe is a big enough reason to celebrate thanksgiving. On a serious note, I have an incredible amount to be thankful for and I think people need to sit down once in a while and celebrate all that they have. Due to it being finals at uni I couldn’t have been more excited to have a few days off and get out of New York city for a while. First off though we HAD to attend Macy’s famous Thanksgiving parade! To get a prime viewing spot I read online that you had to get there for at least 6:30am. ERM sorry no. Not happening. Not ever. So at 10am, a far more sociable hour, we ventured to columbus circle to see what all the fuss was about. Floating spongebob with a Santa hat was the first float I saw. It was pretty fantastic although I was very confused of spongebob’s relevance to thanksgiving?! The parade with floats and marching bands continued all the way from 79th to 34th street. With our over night bags we marched to Penn station ready to head to New Jersey. IT WAS SNOWING. Snow really does make everything look like a winter wonderland. America is beautiful. I am 100% living here, no doubt. The American Embassy have no choice but to immediately grant me a green card. After a beautiful thanksgiving dinner we stayed the night. In the morning it was all over and back to New York it was! Finals. An end is coming, sounds so serious doesn’t it?! I honestly cannot believe how fast my time here has gone, it is truly terrifying!! I don’t want it to end. People are starting to panic, stay up all night, fight for the industrial sewing machines; MADNESS has begun with early nights being 2am finishes. This is what the whole semester has been working toward. I have to say Parsons is like UAL on drugs. It needs to calm down! Everyone is so up in the air they forget to enjoy what they’re doing. Although I am not one to talk; as I usually stress an insane amount when it comes to nearing hand in, however it’s different here somehow. I am more aware of my surroundings, where I am and why I’m here due to it being a new place and knowing it will shortly come to an end. I hope I continue doing this when I’m back in London; it really does make you happier and more inspired. With seven classes all with each individual projects to finish in 3 weeks THE PRESSURE IS ON. 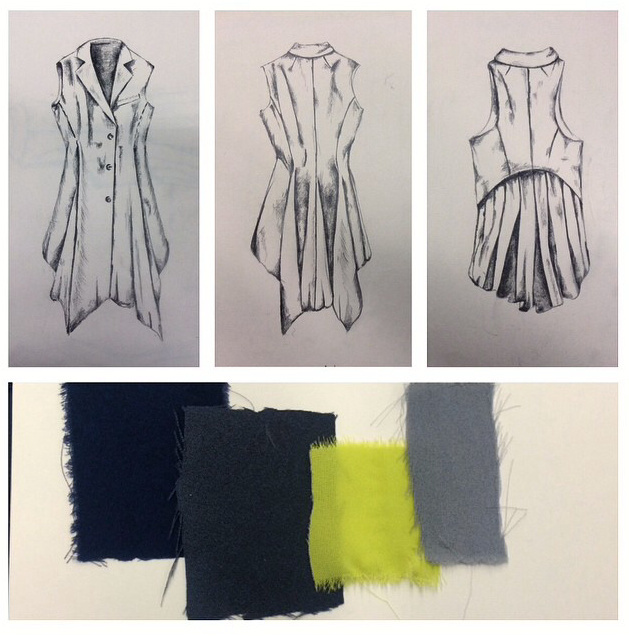 I have designed my draping final (sketches are attached). It’s interesting to think about the construction instead of how I will make the fabric/object. When back at Chelsea I’m going to combine these newly learnt skills with my textiles knowledge. The first sketch was of a tailored waistcoat dress I saw in Christian Dior and fell in love with. I sat on the beautiful plush candy pink velvore chairs and drew – Blissful! The second sketch is my re design of the waistcoat. I want to exaggerate the lapels and collar and bring in the shoulders – exaggerating proportions – making it more modern. The second sketch is the original back of the waistcoat and the third is my redesign of the back. I am not yet sure whether to keep the front straight cut and have the detail in the back. This is something I will decide as I begin draping with muslin. I will be updating my blog with photographs of my finals as I am constructing them. Wish me luck! Niagara Falls – somewhere the majority have heard of yet not many people I know have been due to it being in a bizarre location – just over the border between America and Canada. Coming to New York my family said ‘YOU HAVE TO GO TO NIAGARA FALLS!’ as though venturing to New York wasn’t at all enough! Of course I just had to take their advice! Thinking of when I could go made me realise that time really does fly when you’re having fun! Five months sounds like a long time however in reality it isn’t. October came and me and Tessa, my fellow room mate/wife, went to the travel agents to figure out how we were going to master getting to Niagara. The greyhound bus was my first thought, I have travelled in them all the way up the east coast of Australia so I thought WHY THE HELL NOT?!…. I soon came to realise that 13 hours there and 13 hours back on a bus for 2 nights in Niagara was exactly why not to get the greyhound. However to my absolute joy within an hour of persuading our parents this was the way to do it the plane was booked!!! Having had an OBSCENE amount of work recently/everyday since deciding to do fashion, this was exactly what we needed. ‘Falls view hotel in Ontario Canada’ …. PERFECT! After a traumatic subway ride of not knowing if we were travelling in the correct direction and asking over a dozen people for reassurance we made it to the airport! We flew on what I believe must have been the smallest plane ever built and we were wedged right and the very back in the only seats without a window view – but we didn’t care we were going to NIAGARA FALLS!!! We stayed at ‘Marriott Falls View Hotel’ and what a view it was! We were pretty much the only people that weren’t a couple celebrating their anniversary/honeymoon. The falls were more than amazing – the photos do not do them justice. On the first evening we went on a fireworks night cruise on the falls. I prepared and brought my glasses in order to experience the falls in perfect sight. Much to my dismay after around 30 seconds of just looking at the falls from the boat my glasses steamed and had 1000 water droplets on them resulting in not being able to see anything. The amount of water and mist created from the falls hitting the water below is unbelievable! I resembled a drowned dead rat when trundling off the boat – but it was so worth it! Less than 12 hours later we had another falls cruise but this time we were right in the Canadian horse shoe falls. Taking pictures was genuinely living on the edge; you had to time exactly when you were going to get plummeted with buckets of water from the falls. Luckily I put my camera away just before this happened. It was quite amusing watching people all dressed in red plastic ponchos with pointy hoods screaming and desperately attempting to protect their cameras. I discovered that it was much better just experiencing the falls with your own eyes rather than through a camera lens! Many people forget to live in the moment. I enjoyed every minute of it even if I did get drenched. I highly recommend seeing the falls. Oh and stay on the Canadian side it’s much more well kept than the American side and the horse shoe falls are far more spectacular. After a fabulous weekend its now back to work! I am in complete and utter awe of Jacob Hashimoto’s installation on 24th street New York. Viewing a picture of his work doesn’t do it justice of how labor intensive this installation is. Each square, circle and rectangle was hand cut and pasted. Each string hanging the individual hand made kites has been hand secured into the space. It took a total of four weeks with many helpers to install this installation, I don’t even want to think of how long it took to make every individual piece that is in the space. The space allocated for this installation was beautiful and perfect for the installation. I loved it’s regimented layout contrasted with the brilliant bright colours and interesting shapes and patterns. It was a almost a private space, with just the Sky Farm Fortress being shown in the space. This made the installation all the more impressive. The height of the ceilings was a must and really did make it look like a suspended world. Even the shadows made from the pieces on the walls added to the installation and it was interesting how they would change depending on the time of day. I ask why is it called “Skyfarm Fortress”? I was initially drawn to this piece due to the colour and shape. As a textile designer this is the sort of thing that feeds my inspiration. “Skyfarm is the name of the street in upstate New York where I have a house and ride my bike. Regarding the fortress, I was looking at brutalist architecture and there was this post-war building that was named “one of the ugliest buildings in the world”. With that, I bring some of the Italian, post-war, brutalist foundation, which is like a fortress. Installing these pieces up high allows for the idea of the sky and clouds juxtaposed against the architectural nature of the installation and that is how I came up with the show’s name.” Quoted by Jacob Hashimoto, Huffington Post 9/20/2014. Not exactly what I had imagined would be the reason for the naming of the installation, however it interests me how one installation can have so many different ways of interpretation. I will definitely be following this artist, what an amazing piece of artwork! PippaJayne on Getting ma Knit on! cpickvance on Getting ma Knit on!